COMMENTS: Absolutely love the scent but the fragrance is a bit strong would cut back a little. COMMENTS: This was my first time making soap! Thought I would try first to make for the men in my family and get their feedback! They love it!!!!!! So easy! I'm hooked! • How easy it is! COMMENTS: My client base for this product are adolescents and they swear by it! 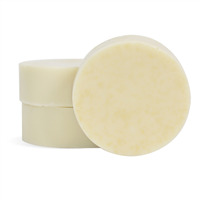 "oatmeal clay tea tree soap"
COMMENTS: Overall the bar turned out wonderful. Good lather, nice light exfoliation caused by the oatmeal soap base. The scent is a bit strong for my liking, however, it was a favorite among the males in my household. I would recommend cutting back on the FO, the combination of "London" FO and Tea tree EO is overwhelming in my opinion. I used it on my face and love what it does for breakouts though. COMMENTS: It is a great product and my husband loves testing. We did find that it is really best to tell the men to use primarily on the face and acne areas. It smells so good that they want to use it all over but doesn't lather because of the the clay but when you let them know what it is best for that helps. I do plan on using the London fragrance for an all over mp body soap. It smells awesome. I used a different mold for this since it was suppose to be on the face and acne prone areas. "forgot to order the oatmeal soap. would it be ok to use goat milk soap?" Staff Answer Yes, you can substitute another soap base. It just may not be the same color as the picture shows. "What type of skin is this good for? Does the clay help the skin or the soap?" Staff Answer This would be great for oily or acne-prone skin. 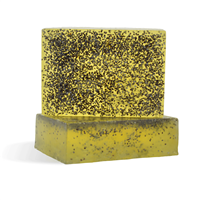 Tea Tree is used in this soap for the antibacterial, antifungal and antiviral properties. 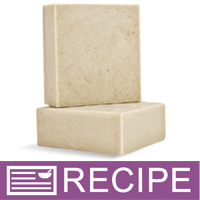 Bentonite Clay has excellent oil absorbing properties and is thought to remove acne causing toxins from the skin.